We’ve heard sitting for too long isn’t good for your health. 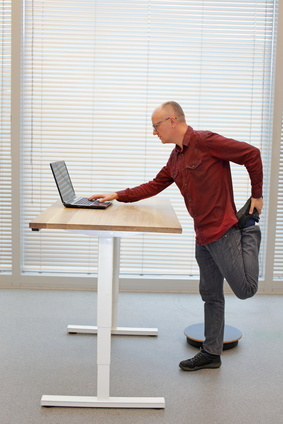 Now experts say standing for long periods of time can be harmful to your body as well. A new study in the American Journal of Epidemiology determined that the physical demands of standing on the job could lead to serious issues like back pain, knee pain, leg pain, foot and ankle pain, cramps, varicose veins, and even clogged arteries and heart disease. In fact, the study which profiled 7,230 people over the course of 12 years, suggests that those with standing jobs are about twice as likely to develop heart disease over others who sit down on the job. The increase in heart disease could be the result of blood pooling low in the legs while standing, with the body then working doubly hard to circulate it and pump the blood back up to the heart. Jobs mentioned in the study that require mostly time on your feet included waiters or cooks, machine operators, teachers and professors, security or hospitality/tourism professionals, and retail sales asscoiates. Take breaks as often as you can, and make sure to sit for a portion of them. Walk around for a few minutes, at least every hour, to stretch legs. Wear comfortable, cushioned, and supportive shoes. Ask to have a chair or stool in close proximity to your work area. Perform squats frequently, along with deep bends at the waist, to keep the back from tightening up. Ideally, your job should have a good mix of sitting and standing throughout the day. If you experience any severe cramping in your legs or back, or any other constant or shooting pains from being on your feet all day, please contact us for an appointment.